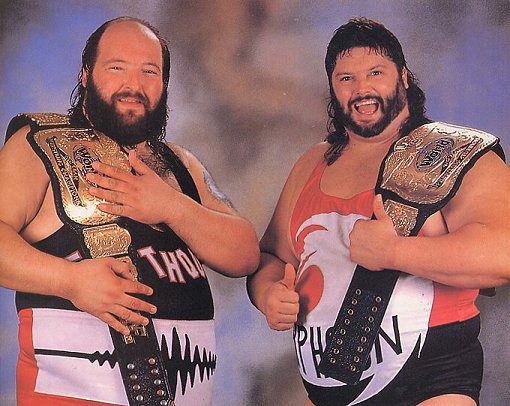 The Natural Disasters: Earthquake and Typhoon formed a team appropriately known as the Natural Disasters. Before these two joined forces The late John Tenta was Earthquake when he first arrived in the WWF back in the late 1980's. Typhoon was Tugboat, but changed his moniker after he became a heel. This may have been the biggest team in wrestling. At least they were as far as I can remember. If I'm wrong, please let me know. When the Quake left WWE for WCW, the brain trust there tweaked his name and he became Avalanche. He would later change his name to the Shark. Typhoon became known as the Shockmaster in a brief WCW run. I think the Shockmaster was a play on earthquake and aftershocks, but I don't know that for sure. I think really more people were shocked by his debut. If you don't know what I'm talking about, click here. The Texas Tornado: Kerry Von Erich came spinning into the WWF in the summer of 1990 under the name "The Texas Tornado". This was a time when Vince McMahon was tagging most of his superstars with a trademarked nickname. Ricky "the Dragon" Steamboat simply became "The Dragon", Davey Boy Smith was known as only "The British Bulldog". You get the picture. 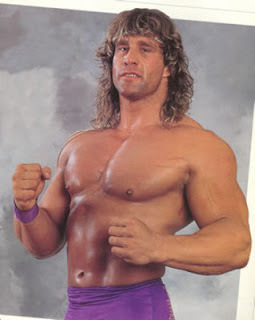 As the Texas Tornado, Kerry had a fairly quick rise to the upper mid-card in the WWF after winning the Intercontinental title at SummerSlam 90. Even after he lost the title, he was still one of the companies top faces. He had always been one of my favorites, so seeing him on the national stage made me happy. I just questioned the name change and the fact that they almost completely ignored his heritage in the business. Times were different back then. Sadly, Kerry died in 1993 of a self inflicted gunshot wound. He was only 33 years old. I often wonder where his career would have taken him, had he not died. The Hurricane: Shane Helms or Gregory Helms became the crime fighting Hurricane Helms and eventually was simply known as the Hurricane. He held a handful of titles in WWE, including the tag team titles with Kane and Rosey. If my memory serves me correctly, the WWE dropped the Hurricane name and gimmick in 2005 around the time of Hurricane Katrina, a disaster that killed nearly 2,000 people. He went back to just being Gregory Helms. It wasn't until 2009 the gimmick reemerged. He was eventually released from the WWE in 2010. These are the most memorable weather related wrestling gimmicks. At least the ones I can think of. Although I did meet a female indy wrestler named Rain. And TNA now has Winter, formerly known as Katie Lee Burchill and Madison Rayne. While we're on the subject of cold stuff, I guess you can throw Glacier in there too, right? Don't forget about Al Snow, although that was more of his last name and not an actual gimmick. And I think back in the day there was a tag team known as Thunder and Lightning, wasn't there? 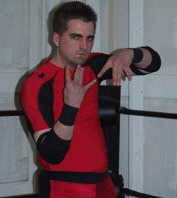 Another independent wrestler on the southern Illinois scene is "The Wrestling Meteorologist" Matt Thunder. I wonder how he would have held up against Earthquake and Typhoon. You'll hear more from Thunder in the coming weeks. Chad and I are soon starting a new feature with wrestlers around the country, so stay tuned for the details. It seems like most wrestlers today have more conventional names. We're no longer in the era of silly, fun, or goofy gimmicks and names. Just something I've noticed and finally took some time to write about. As always, "like" us on Facebook. Follow us on Twitter. And subscribe to the YouTube channel. Thanks! On the thought of Thunder and Lightning, there's the Japanese legend, Jushin "Thunder" Liger and Chikara founder, "Lightning" Mike Quackenbush. Just trying to see how many times I can get a Chikara mention on the blog in the coming month. Ha. Excellent points. Sorry I overlooked them. I knew I would forget someone. I guess there's the Lightning Kid too.